The new hydro walk-behind turf aerator by Lawn Solutions is so revolutionary that it is changing how the industry looks at aerating. 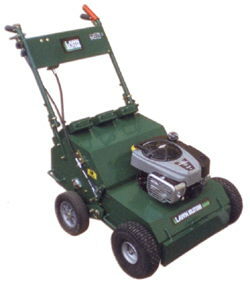 It is as easy to operate as a walk-behind mower. It features a true variable speed hydrostatic drive system that aerates both forward and backward and allows the operator to actually zero turn while aerating without having to raise the tines to turn. This unit is more than 50% more productive than traditional aerators and without the fatigue associated with traditional aerators. Speed 0-4 mph: Hydrostatic w/ 2 cruising speeds.